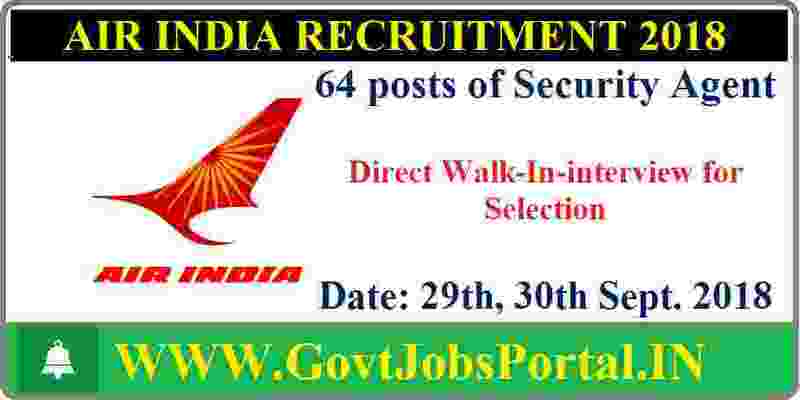 Air India Air Transport Services Limited (AIATSL) is looking to recruit Indian fresher candidates for Security Agent posts in Airports. 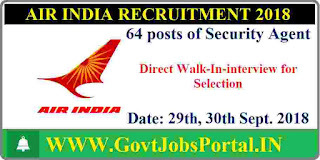 Air India wishes to involve Indian Nationals (Male & Female) who meet with the following necessities for the post of SECURITY AGENT, for ground duties at Goa Airport & its establishments at Goa to fill-in the existing vacancies as shown below and to maintain a wait-list for vacancies arising in future on a Fixed Term Contract basis for a period of 3 years which may be renewed subject to their performance and the requirement of the Company. Interested candidates, who fulfill the specified worthiness criteria as on 1st September 2018, are required to WALK-IN in person along with the Application Form duly filled in, requisite Fee and original testimonials along with one set of self-attested documents supporting their eligibility. More information related to this Air India Recruitment process is given below in this article. Read the whole article carefully before applying for these security agent jobs. EMOLUMENTS: Rs. 18,360/- per month. On acquiring / having valid AVSEC qualification & X-BIS certification, additional allowances i.e. Rs.1000/- for BASIC AVSEC and Rs.1500/- for X-BIS will be paid as applicable. Eligibility Criteria for Applying these Government jobs? Educational Criteria: All Indian Graduate candidates can apply this Air India Recruitment process. Candidates must have a Valid Basic AVSEC / Without Basic AVSEC can apply. Age Bond: Applicant age must be less than 31 years for applying these Air India jobs 2018. Applicants meeting with the eligibility criteria mentioned in this advertisement, as on 1ST SEPTEMBER 2018, are required to WALK-IN in person, to the venue, on the date and time as specified above along with the Application Form (available on the Company web-site www.airindia.in ) duly filled-in & along with all original Certificates / testimonials / in support of Date of Birth, Educational Qualification, NCC Certificate, Doctor‟s Certificate for height and weight, Caste certificate (for SC/ST/OBC candidates), Discharge Certificate (for ExServicemen), Experience Certificate, if any, and 5 recent passport size photographs. Applicants are required to furnish self-attested copies of all the certificates/testimonials as mentioned above along with application form. Please note that Original Certificate/s are not be to submitted with the Application Form. However candidates are required to bring all Original Certificates for verification purpose only. The Company is not responsible for returning any original copies of Certificates /Testimonials submitted with the application. 29TH, 30TH Sept. 2018 is the Interview Date.